It is summer time which means it is time for parties, barbecues and picnics! There is nothing that irks me more than going to a party and the host does not have some sort of recycling bin. So all those cans and bottles end up in the trash. I usually end up bringing whatever I used home with me to recycle myself, because I cannot stand to trash something that can be recycled. We host 3 birthday parties ourselves every year (some at home, some at a hall) and I always find something to collect recyclables. Usually I take an empty cardboard box and put a "Please Recycle" sign on it. Not only is this a pain for parties not at home, but inevitably someone does not notice it and I am left rummaging through trash to fish out cans. This is where Flings comes to the rescue. Flings Pop-Up Trash & Recycle Bins offer the perfect trash and recycling solution to any party. I was sent one of their recycling bins to test out. It unfortunately did not arrive in time for my Twins' birthday party a few weeks ago, but I can't wait to use it for my baby's first birthday come December. The Flings Bins comes folded up pretty much flat which makes it super easy to store until party time and then transport to your party destination. When you are ready to use it, simply pop it open in seconds and set it down. 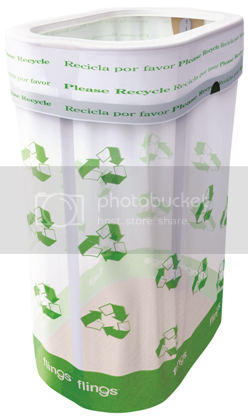 What is really great about the Flings Recycle Bin is that it is completely covered in the recycling symbol so there is no missing it. No more wondering about trying to figure out where to put the empty soda can and no more stacks of recyclables on your counter. Each bin can hold roughly 60 cans or bottles. The Flings are priced affordably so they can be disposable, but you know me, I prefer reusable! Well your Fling can be reused too - it all depends on what you prefer and how messy it got. The bin itself is recyclable so you could just tie it up and toss the whole thing into your curbside recycling bin. However, if you are like me and want to reuse it, dump the cans/bottles/whatever into your curbside bin, hose down or rinse out your Flings bin, let dry and then tuck it away for the next party! If you are using your Flings bin for trash, well than you may not want to reuse it, but at the very least dumpy the trash into your garbage can and then recycle the Flings bin. Now we are just a few days away from the Fourth of July and I know many of you will either be hosting or going to a fun holiday party this weekend. Flings Bins and Jeanne Benedict have put together some really fun patriotic party ideas that you really need to check out. So take a few minutes to watch this quick video and see how you can easily dress up your party using scrap booking supplies! The Flings Bins are very reasonable priced at around $4.00 each and they come in a variety of designs: recycle, birthday, picnic and more. They may be purchased directly at the Flings Online Store in packs of 4 or 10. All orders receive free standard shipping in the US. Flings Bins may also be purchased at Amazon.com . "Like" Flings Pop-Up Bins on Facebook. - Watch the video above and then leave me a comment with your favorite summer/4th of July party tip - either your own or one mentioned in the video. This giveaway is open to US Residents 18+ only and will end on Wednesday, July 14 at 11:59pm EST. One winner will be chosen at random using Random.org and will be posted on the Winner's Announcement Page. Winner has 48 hours to claim his/her prize otherwise a new winner will be picked. You must leave your e-mail address in all of your comment(s) so I can contact you. I will not share your e-mail address with anyone, it will strictly be used to notify you if you win. Good luck! My party tip would be to make sure you have plenty of shade and water on hand to keep your guests cool and hydrated! I "Like" Flings Pop-Up Bins on Facebook. I thought it was cute how in the video they put the potato salad in cupcake foils. Interesting video! I love how she used the pinwheel to decorate the vase/candle holder! I like Flings on Facebook - ncschools.